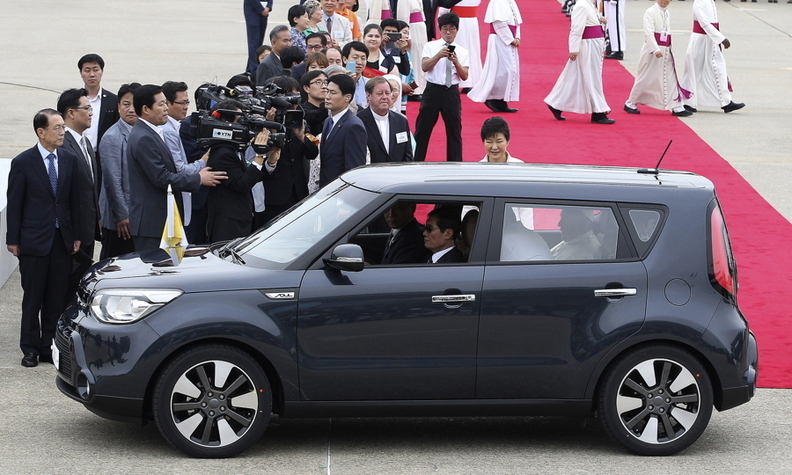 Pope Francis sits in the back of a Kia Soul that will be used to transport him during his 5-day visit to South Korea. SEOUL (Bloomberg) -- Pope Francis is helping to elevate the profile of the Kia Soul beyond that of the car of choice for dancing hamsters. The pope slipped into the back of the Soul and rolled down a window to wave at the welcoming party, including President Park Geun Hye, as he kicked off a five-day visit to South Korea today. The 77-year-old is scheduled to preside over a beatification ceremony for Korean martyrs that is expected to attract hundreds of thousands of people to the city center in Aug. 16, according to organizers. The pontiff's choice is a victory for Kia at a time when the won, last quarter's fastest-appreciating major currency, is eroding South Korean exporters' earnings. The selection also underscores the pope's preference for small cars, a departure from past Popemobiles, such as the custom-built, bulletproof Mercedes-Benz Pope John Paul II used to ride on. "This will help Kia by bringing far-reaching exposure through the mass media," Kim Jin Kook, CEO of auto researcher Marketing Insight, said by phone. "That exposure will be related to the pope, who has a very positive image among the general public, which in return will trigger a halo effect for Kia." Kia said in an e-mail that it is honored by the pope's use of the Soul, declining to comment on whether modifications were made to the vehicle. His predecessors have preferred roomier rides amid security concerns. Pope Benedict XVI often rode in a bomb-proof Mercedes and used Audi's A8 during his visit to Germany. For Seoul-based Kia, the nation's second-largest carmaker after top shareholder Hyundai Motor Co., the Soul was its fourth-most popular vehicle overseas last year, according to company data. The Soul ranked eighth in Europe's small minivan segment during the first half with 4,173 sales, according to figures from UK-based researcher JATO Dynamics. The second-generation Soul was introduced last year at the New York auto show ahead of its European and U.S. sales debuts. The original model was first unveiled in 2008 and became a sales and marketing hit helped by commercials featuring dancing hamsters.